Do you have furniture that you’d like to sell on Craigslist? If you’ve never posted on Craigslist before, or have had little luck selling in the past, below are some tips to make your next post stand out to potential buyers. If you’ve browsed Craigslist before, you know how important the title of a post is in the never-ending list of plain text items for sale. The title of your post gives buyers the first taste for what it is you’re selling. All of the furniture for sale on Craigslist is listed under one category: furniture. Sounds simple, but if a buyer is looking for a specific item they’d need to search specifically for that title, or comb through dozens of pages of irrelevant posts. 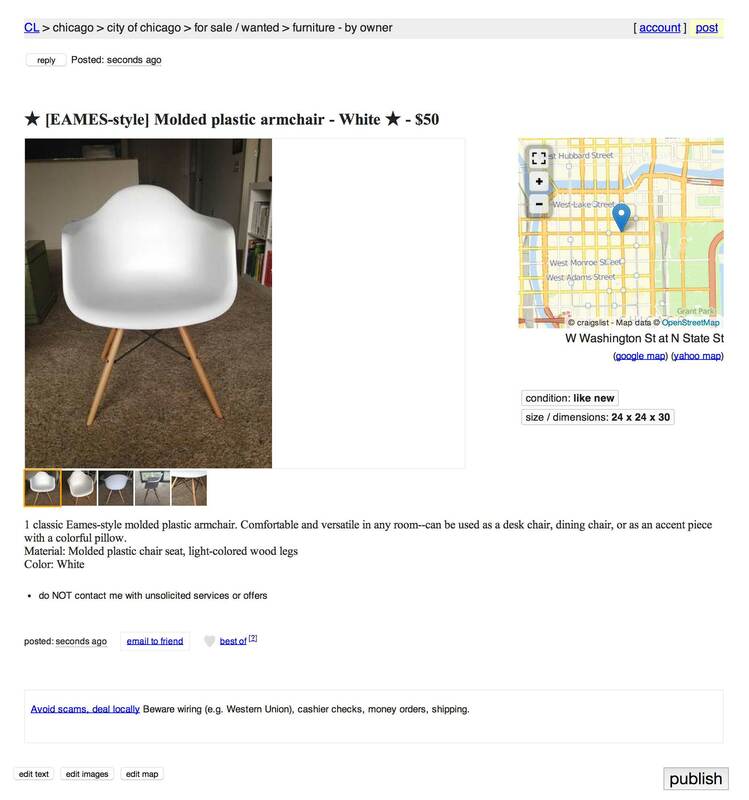 Let’s say you have an Eames plastic armchair you’d like to sell on Craigslist. Be sure to say that it is an Eames chair in the title (or the less expensive knockoff version). Another way to make the title of your post stand out from the list is to include Unicode or ASCII characters. Think of these as browser-compatible emojis. You can find a comprehensive list of ASCII codes here: http://easyascii.com. Don’t go into too much detail in your listing’s title. The color or material of the item is ok to put, but focus on what the item actually is, opposed to what it does or what it looks like. That’s what the description and photos are for! Lastly, please don’t forget to divulge any defects or blemishes—be kind to interested buyers and don’t give a false perception of perfection if the item isn’t in perfect condition. In addition to your neighborhood/town, Craigslist allows you to enter the street and cross street of the item so interested buyers can get an exact idea of the time commitment it takes to come out and look at what you’re selling. Please remember to use caution and common sense if people will be coming to your home to see the item. The photos you upload of your item may be the most important part of your entire post. Being able to see what the item actually looks like can turn a browser into a buyer. With the ubiquity of cell phones and digital cameras, it’s never been easier to take great photos of your item. Offering delivery on your Craigslist item can increase your responses by over 25%. Many people in the city would love to buy your item, but don’t have a way to get it home. Offering delivery with Dolly can help sell your item quicker and even for more money. In some cases buyers are willing to pay an extra $100 for an item that came with free delivery (costs about $35 on average to deliver). It’s easy to offer delivery for your item. Just let your buyer know that you’re open to having a Dolly Helper come and deliver the item to their place. Tell them to download the app at http://getdolly.com/download.